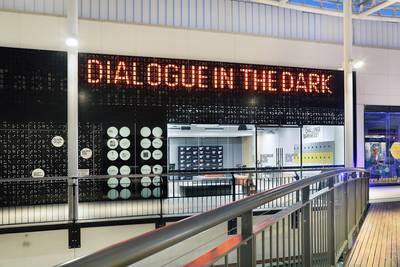 If you've not heard of of Dialogue in the Dark™ you need to head to District Docklands to "see" what all the fuss is about. Dialogue in the Dark™ is a one-of-a-kind sensory activity now found in 42 global destinations around the world. Melbourne is one such place to offer the exhibit, which promises to be unlike anything you've ever experienced before. Dialogue in the Dark™ takes you on a sensory journey through "Melbourne" in total darkness, led by someone who is blind or has low vision. Experience Melbourne like you never have before, learn about yourself, and have fun along the way. 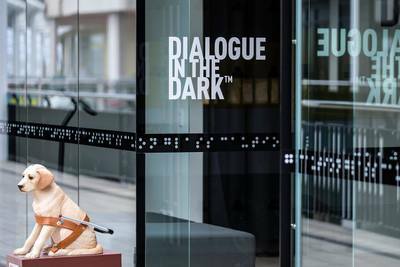 Presented in partnership with Guide Dogs Australia, Dialogue in the Dark™ is an immersive experience designed to push your senses and problem-solving skills to the limit. Suited to families and children age 5 years plus. Children under 5 years are not permitted. When: Tuesday - Sunday from 10:30am. Monday: Closed. We have a Family Pass Giveaway for Dialogue in the Dark™ at District Docklands for the Autumn school holiday season. To enter, comment over on Facebook.GIFs and Emojis always encouraged. Please remember to like us on Facebook otherwise we can't tag you if you win! Due to the limited time left, we will keep this competition open until Sunday 8 April 2018 at 9pm.